Ahh #02076, why are you the worst ID? Who wants to spend exactly 1 click per turn advancing ice? No one. However, with the addition of morph subtype ice in the lunar cycle, this ID could stand to have a second opinion. Since it was released, BWBI has classically been a late game ID. Weyland Consortium: Because We Built It builds up momentum by advancing its ice (usually Ice Wall) to monstrous levels appealing to late-game taxing. With a near-mandatory of 3x include of Trick of Light this leaves a nice number of targets for moving advancements. Commercialization is also a late-game opportunity for large monetary gains. With the addition of Morph in Lycan and Wendigo and Changeling as well as Will-o'-the-Wisp, the corp can force the runner to get out their rig before being able to run effectively while building up free tokens, and preparing more formidable ice for a scoring server. As an additional possibility, for better biting ice try Executive Boot Camp with Woodcutter or Salvage. Tyrant is bad no matter how you cut it. 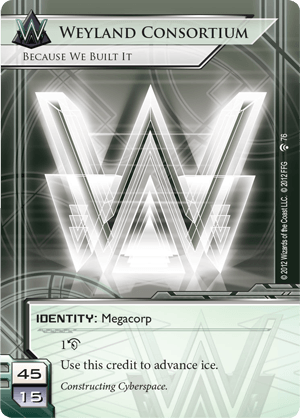 As always, Meat damage is a plus in Weyland Consortium: Because We Built It, but since the ID tends towards late game, putting the pressure on with tags is recommended to prevent aggro from runners.